This handbook focuses on some important topics from Number Theory and Discrete Mathematics. These include the sum of divisors function with the many old and new issues on Perfect numbers; Euler's totient and its many facets; the Möbius function along with its generalizations, extensions, and applications; the arithmetic functions related to the divisors or the digits of a number; the Stirling, Bell, Bernoulli, Euler and Eulerian numbers, with connections to various fields of pure or applied mathematics. 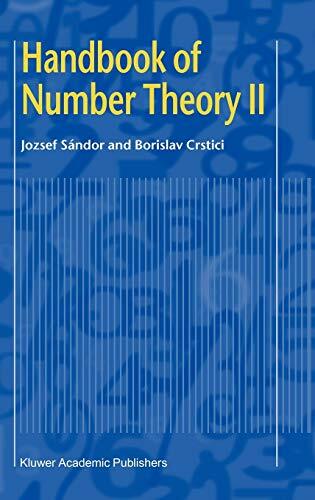 Each chapter is a survey and can be viewed as an encyclopedia of the considered field, underlining the interconnections of Number Theory with Combinatorics, Numerical mathematics, Algebra, or Probability Theory. This reference work will be useful to specialists in number theory and discrete mathematics as well as mathematicians or scientists who need access to some of these results in other fields of research. Casa editrice: Springer-Verlag New York Inc.